Looking for a way to soothe chapped lips and relieve dry, cracked skin? Then Murad Soothing Skin and Lip Therapy is definitely something worth checking out. I luckily received a sample of this during the Beauty Tour at the Total Beauty Summit, and I have to say I fell in love instantly. Putting the word "soothing" in the product name was assuredly the way to go here -- I literally cannot think of a better word to describe this product! Not quite a balm, not quite a gloss, the tube delivers some of the most healing and rejuvenating salve I've come across in a long time. Petroleum, BHAs and Vitamin E help to seal in moisture, smooth and exfoliate any dry areas almost instantly, while lanolin keeps your skin and lips from being damaged by environmental exposure. Best of all, it's not waxy -- so it doesn't feel horrible on your lips or on your skin. And if that's not enough to convince you ... it smells like strawberries! Totally perfect for summer. 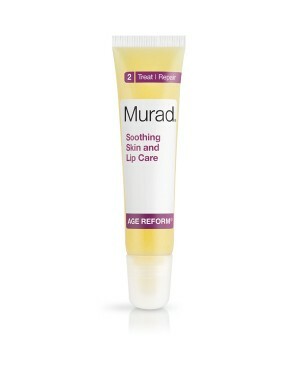 Murad Soothing Skin and Lip Care retails for $20 at murad.com.